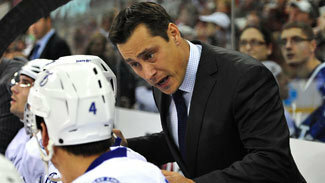 WINNIPEG -- The Tampa Bay Lightning on Sunday announced that coach Guy Boucher has been relieved of his duties. Lightning general manager Steve Yzerman said the decision was made late Saturday night, after the Lightning lost 5-3 at the Ottawa Senators. The loss, the Lightning's 10th in 14 games, left Tampa Bay 14th in the Eastern Conference, five points out of a playoff spot. "I'm not satisfied with the direction that our hockey team is going," Yzerman said at a press conference Sunday in Winnipeg. "This isn't a reaction, a desperate act, to try to make the [Stanley Cup Playoffs], although that is still our hope, regardless of what where we sit in the standings." Next up: Who will succeed Boucher in Tampa Bay? "There's a certain type of play, a certain style of play that I'm expecting from our team with the type of players that we are putting out there" Yzerman added. "It's a difficult question to answer. Guy Boucher did a tremendous job and worked extremely hard. I take full responsibility for this. I have to make decisions." Yzerman hired Boucher in June 2010, not long after he accepted the job with the Lightning. In their first season together, Boucher guided the Lightning to the franchise's second-ever 100-point season, a return to the playoffs after a three-year absence and a trip to the Eastern Conference Finals, where they lost 1-0 in Game 7 to the eventual Cup champion Boston Bruins. However, the Lightning missed the playoffs last season and look to be heading to a second straight season out of the postseason in 2012-13. In two-plus seasons, Boucher's record is 97-78-20. The loss to Ottawa on Saturday, in which the Lightning allowed four first-period goals, appeared to have doomed Boucher. "Watching the entire situation after [the game Saturday]," Yzerman said, "it just felt that this needs to be addressed immediately. "I noticed a difference in our play and a difference in the attitude. Just in observation of the players, it felt like the situation was worsening, and quickly worsening, and something needed to be done immediately." While the loss to Ottawa finalized Yzerman's decision, the Lightning's overall situation has been deteriorating for some time. Consecutive losses to the Senators and the Toronto Maple Leafs were just the latest in a series of setbacks. "This thing has been teetering a little bit," Yzerman said. "The past two games, you kind of try to measure your team, the atmosphere, the attitude and what not, so, no, I'm not totally caught by surprise." Sunday against the Winnipeg Jets, assistant coaches Daniel Lacroix and Martin Raymond, along with player development coach Steve Thomas, will split the coaching duties. Yzerman said he wants to have a new permanent coach in place as quickly as possible -- the Lightning's next game after Sunday is a Tuesday matchup at home against the Buffalo Sabres. Yzerman did not wish to discuss any particular candidate or which type of coaching philosophy he may have in mind. Among the rumored replacements are former Buffalo Sabres coach Lindy Ruff, who Yzerman, as executive director of Canada's 2010 Olympic team, hired as an assistant coach, and Jon Cooper, who won an American Hockey League championship with the Norfolk Admirals, the Lightning's AHL affiliate last season, and has their affiliate this season, the Syracuse Crunch, atop the league standings. "[Firing Boucher] was done not only for the short term, but more importantly, for the long term of our organization, where we're going and where we want to get to," Yzerman said. "I'm not looking to drag things out. I have an idea for what I want to do and a plan for what I want to do, and I want to try to get that accomplished as quickly as possible. "I'm going to hire a coach for the remainder of this year and for the years to come. I know what I want, and I will try to get that done as quickly as possible." Yzerman also met with his club Sunday morning at a hotel in downtown Winnipeg and outlined his edict. "I'm not satisfied with the direction we're going," Yzerman said. "I'm obviously not happy with a lot of things this season. We all share in the responsibility of where we sit today, but I expect our players to be professional, I expect them to play hard and play their best and do everything that we can to try to climb back into the playoff race. "Respect the [interim coaches] that are here and going to do the job for the time being. There's a lot to play for here, whether it's fighting for a playoff spot, playing for your teammates, playing for your own job, playing for your position -- there's a lot to play for here."